Through in-depth research into and keen analysis of these three moments, as well as his own firsthand experience as an advisor to the Palestinian delegation at the 1991 pre-Oslo negotiations in Washington, DC, Khalidi reveals how the United States and Israel have actively colluded to prevent a Palestinian state and resolve the situation in Israel’s favor. 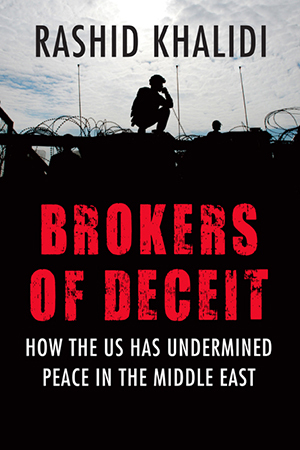 Brokers of Deceit bares the truth about why peace in the Middle East has been impossible to achieve: for decades, US policymakers have masqueraded as unbiased agents working to bring the two sides together, when, in fact, they have been the agents of continuing injustice, effectively preventing the difficult but essential steps needed to achieve peace in the region. "Unpacking these episodes in sharp, take-no-prisoners prose, Khalidi maintains that the U.S. and Israel, 'by far the most powerful actors in the Middle East,' through successive administrations and a variety of key officials … have conspired to deny Palestinians any semblance of self-determination. A stinging indictment of one-sided policymaking destined, if undisturbed, to result in even greater violence." In politics and in diplomacy, as in much else, language matters greatly. However debased political discourse may become, however disingenuous diplomacy often is, the words employed by politicians and diplomats defi ne situations and determine outcomes. In recent history, few semantic battles over terminology have been as intensely fought out as those concerning Palestine/Israel. The importance of the precise use of language can be illustrated by the powerful valence in the Middle East context of terms such as “terrorism,” “security,” “self-determination,” “autonomy,” “honest broker,” and “peace process.” Each of these terms has set conditions not only for perceptions, but also for possibilities. Moreover, these terms have come to take on a specifi c meaning, frequently one that is heavily loaded in favor of one side, and is far removed from what logic or balance would seem to dictate. Thus in the American/Israeli offi cial lexicon, “terrorism” in the Middle East context has come to apply exclusively to the actions of Arab militants, whether those of the Palestine Liberation Organization (PLO), Hamas, Hizballah, or others. Under these peculiar terminological rules, the actions of the militaries of Israel and the United States cannot be described as “terrorism,” irrespective of how many Palestinians, Lebanese, Iraqi, or Afghan civilians may have died at their hands. Similarly, in this lexicon, “security” is an absolute priority of Israel’s, the need for which is invariably described as rooted in genuine, deepseated existential fears. “Israeli security” therefore takes precedence over virtually everything else, including international law and the human rights of others. It is an endlessly expansive concept that includes a remarkable multitude of things, such as whether pasta or generator parts can be brought into the Gaza Strip, or whether miserably poor Palestinian villagers can be allowed water cisterns.1 By contrast, in spite of the precarious nature of their situation, Palestinians are presumed not to have any signifi cant concerns about their security. This is the case even though nearly half the Palestinian population have lived for more than two generations under a grinding military occupation without the most basic human, civil, or political rights, and the rest have for many decades been dispersed from their ancestral homeland, many of them living under harsh, authoritarian Arab governments. This book is concerned primarily, however, not with the misuse of language, important though that is, but with an American-brokered political process that for more than thirty-fi ve years has reinforced the subjugation of the Palestinian people, provided Israel and the United States with a variety of advantages, and made considerably more unlikely the prospects of a just and lasting settlement of the confl ict between Israel and the Arabs. This is the true nature of this process. Were this glaring reality apparent to all, there might have been pressure for change. But the distortion of language has made a crucially important contribution to these outcomes, by “corrupting thought,” and thereby cloaking their real nature. As we shall see in the pages that follow, language employed in the Middle East political context--terms like “terrorism” and “security” and the others mentioned above--has often been distorted and then successfully employed to conceal what was actually happening. Click here to listen to Rashid Khalidi on Chicago Public Radio's "Worldview"
Khalidi is quoted at length in "A Gaza Stripped Anew" in Outlook India. Click here to listen to Rasid Khalidi on Building Bridges/WBAI, "Collective Punishment in Gaza: The Palestinian/Israeli Conflict in Context"